It is statistically shown that more severe, debilitating injuries occur from the table saw than any other woodworking machine or power tool. When it comes to handheld woodworking power tools, the circular saw may take that crown as the most dangerous. How can you use one safely in your woodshop or on the job site? First off, whenever using any power tool, always wear appropriate safety equipment, including safety glasses, hearing protection, and appropriate clothing. By committing these three pillars of woodworking safety to habit, you can greatly reduce some of the most common circular saw injuries. When preparing to make a cut, set the depth of cut so that the blade is no more than 1/4-inch below the bottom edge of the board to be cut. It makes little sense to have two-inches of saw blade exposed beneath a cut on a 1/2-inch thick sheet of plywood. Not only can the extra blade beneath the cut catch on something else beneath the cut board, but the angle of the blade as it cuts the wood will leave a cleaner cut behind than if the cutting edge approaches the board more squarely. Not only is adjusting your blade to have less exposure beneath the cut safer, but it yields a better-finished result! The blade guard on your circular saw can seem a nuisance at times, especially as it can get caught and not retract properly when cutting thin materials. If you need to manually retract the saw blade guard to allow the saw to move forward, use your off hand to reach over and grab the blade guard and lift the handle to allow you to move the saw forward. Do not use anything to prop the blade guard into an open position, as this leaves the blade exposed. When using your circular saw, keep your blades sharp and free of pitch. A dull blade can easily bind and kick back, where a sharp blade will cut through the wood faster and cleaner. In order to discuss circular saw safety, one must first understand how to properly cut with a circular saw. Most direct drive circular saws have the blade mounted on the right-hand side of the saw's motor, so a right-handed operator must lean over the saw to be able to see the cut line. On a worm drive saw, the blade is predominantly mounted on the left-hand side of the saw's body, which can make for easier visibility of the blade as it engages the cut line for a right-handed operator. Each of these scenarios are reversed for a left-handed operator. Before you begin cutting, position the board or sheet good to be cut onto a stable surface in such a way that the item being cut is secure and that the portion being cut away will not bind as the cut is proceeding. We prefer to support larger boards or sheets with a couple of cutoffs that will hold it off of the sawhorse or other boards which may be beneath the but piece. For instance, if you're cutting a sheet of plywood on top of the stack, using a couple of short 2x4s to support the cut piece is a good start. However, by using at least one more section of 2x4 to support the cutoff, you prevent the cutoff from binding the blade or breaking off before the cut is complete. When making a cut, we like to use a straight edge for long cuts or a combination square for shortcuts as a guide for the circular saw. To use a square, merely align the saw blade with the cut line and position a combination square with the lip firmly against the far edge of the cut piece and the perpendicular edge of the square aligned with the side of the saw's base. As you begin the cut, keep the edge of the saw's base firmly against the side of the square, and your cut should be straight and true. For longer cuts on plywood, use a metal straightedge and a pair of clamps to hold the straight edge in place, which you can then use as a guide for the circular saw in the same manner. After you've completed the cut, release the trigger while keeping the base of the saw in contact with the cut piece until the saw blade has stopped rotating. Once the blade is stopped, you can safely set the saw down. Too many times, I've seen a power cord get in the way of a spinning blade as the saw was being set down while still in motion. This can lead to a cut power cord or worse, the operator could be injured by the still-spinning blade while trying to keep from damaging the power cord. Circular saws are light and can cut quickly and easily through more than just wood. For that reason, I've seen many a construction worker trying to use a circular saw to cut a board while holding the board in his off hand instead of supporting the board on a sawhorse or stack of lumber. This is extremely dangerous because if the cut binds, the saw can be propelled one way (with a spinning blade exposed) and the board being cut can be flung another direction, either of which can hit the operator or any bystanders. Even though the operator is resting the board across two sawhorses, the image above is a good example of how not to use a circular saw. If he places the board flat across the two sawhorses and then aligns the base of his worm drive saw evenly with the top of the 2x4 to make the cut, allowing the cutoff to fall away, he will be much safer. Additionally, don't use the circular saw for a task for which it isn't intended. 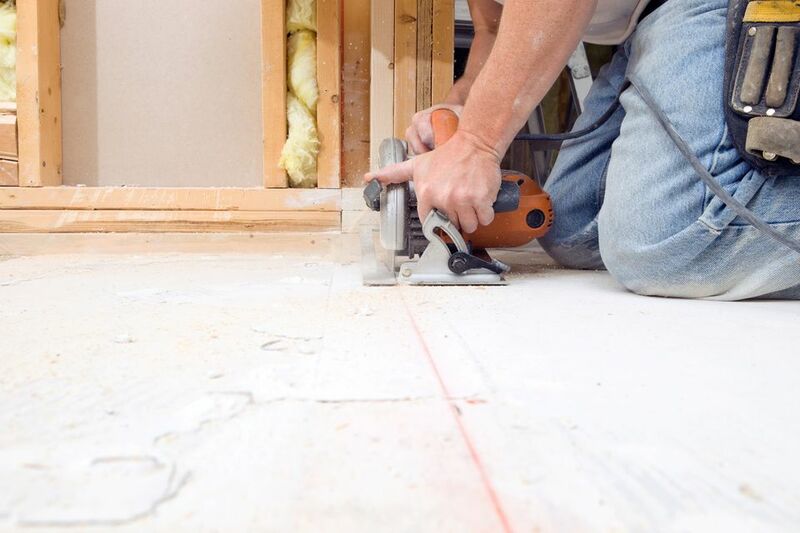 For instance, if you need to make a cut in an installed wall stud or rafter, using a reciprocating saw may take a little longer than using a circular saw, but it is much safer. Using your tools in the methods in which they are intended will keep you and those around you much safer on the job site or within the confines of your woodshop.